In this project, we are going to make a LED Binary Clock Using Arduino. Here we have designed a printed circuit board (PCB) to implement this clock. To design PCB layout, we have used EasyEDA online PCB designing tool. This is very simple, cheap and interesting project for the learner. In this LED Binary Clock Circuit, we have used Arduino Nano to control the whole project like reading time from RTC and showing that on LEDs. A 3.0v coin cell is connected to RTC IC for backup. Learn more about using DS1307 RTC with Arduino here. 20 LEDs are connected here in matrix form. So here we have 6 columns and 4 rows. 2 columns used for showing hour, next two columns for minutes and next to columns for seconds. We have used 6 PNP transistor to triggers LEDs in 6 columns. The user can power the whole circuit by 5v only, here we have used laptop USB for power supply. Rest of connections are shown in circuit diagram. Further, check the complete Arduino Code and Demonstration Video at the end of this Article. As we are familiar with binary numbers that are zero and one. So by using these, we can show time and we can convert that binary time into the decimal. By using the number 8 4 2 1 (written on the Right side of PCB), we can convert binary to decimal. 1 0 1 0 so it will be 10 in decimal. When we convert binary to decimal we only add ones. Here from MSB (Most significant bit) side, we have 1 it means 8 and next is 0 means that is 0 and not to be included. Next is again 1 means 2 and the last is 0 so the last one will also not be included. So in Hour HH column, we got 01. Complete Arduino Code and Demonstration Video is given at the end of this Article. 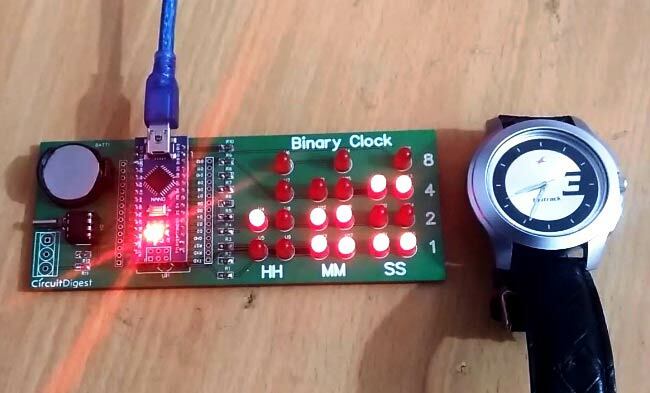 To design this LED Binary Clock Circuit, we have chosen the online EDA tool called EasyEDA. I have previously used EasyEDA many times and found it very convenient to use since it has a good collection of footprints and its open-source. Check here our all the PCB projects. After designing the PCB, we can order the PCB samples by their low cost PCB fabrication services. They also offer component sourcing service where they have a large stock of electronic components and users can order their required components along with the PCB order. After completing the design of this Arduino Binary Clock PCB, you can order the PCB through JLCPCB.com. To order the PCB from JLCPCB, you need Gerber File. To download Gerber files of your PCB just click the Fabrication Output button in EasyEDA editor page, then download from the EasyEDA PCB order page. And after getting these pieces I have soldered all the required components over the PCB, placed the coded Arduino Nano and powered it with 5v supply to see the Binary Clock in Action.
" Arduino: 1.8.6 Hourly Build 2018/01/03 03:33 (Windows 7), Board: "Arduino/Genuino Uno"
Multiple libraries were found for "RTClib.h"
(1) Wire.h, (2) RTClib.h (3)TimerOne.h ... already installed these three libraries.. still gets the error mentioned in my previous mail, but what are the other libraries to be installed to get error less compilation, do you able to compile the code successfully. These variables (next, set_mad, INC) are not used. Just comment (//) out the offending lines. This is a great project but you could much improve your code by commenting it explaining what each section does and what variables are declared and why. This is a pretty nice Project and I want to rebuild it. Unfortunately I can't find which resistor (1k or 10k) to use in which position. Your circuit diagram shows 6 transistors (Q1-6, BC557A) and 10 resistors (R1-R10). These parts are not in your component list. Are 2N5087 transistors equivalent? What are the values for R1-R10? I ordered the boards to use in a computer science class that I teach and want to make sure I have the right components. Thank you for your help. BC557A is a PNP transistor of general purpose, like a 2N5087, then should it work without problem. R1 to R10 are to limit the current over the LED's, Arduino's out pin deliver 5V, if you use red LED's (2V), my friend Georg Simon Ohm would say: R=V/I=(5V-2V)/0.02mA = 150 Ohms, in general, 150 Ohms seems to be a safe value for any conventional led. Regards and good luck. CAN YOU PLEASE EXPLAIN THE LOGIC YOU HAVE USED TO PATTERN THE LED'S? explain what logic have you used while displaying through LED's?